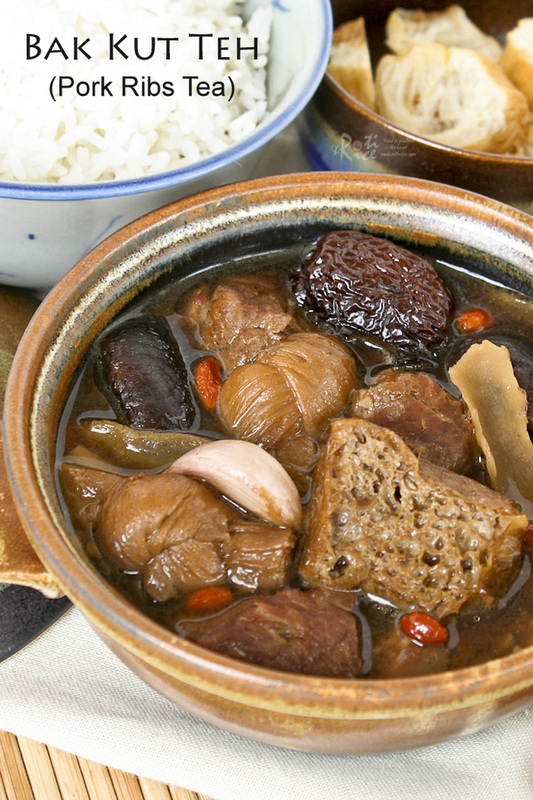 Bak Kut Teh in the Hokkien or Fujianese dialect literally translates to Pork Rib Tea. This rich herbal soup contains dong gui (Angelica Sinensis), known for its warming properties. For this reason, it is popularly eaten as a supper or late night meal in Malaysia and Singapore. Over here in Minnesota, I like to cook it in the winter as it helps ward off the cold. In the old days, the herbal mix can only be purchased at the Chinese “medicine shop”. Today most grocery stores in Malaysia and Singapore carry them in sachets where the herbs are ground to a powder. These sachets can also be found here in the US. I much prefer the “real thing” with the whole herbs. Whenever I visit my mom in Malaysia, she will take me to the “medicine shop” where the Ah Pek (uncle) will combine the herbs into neat packages and properly seal them for me to bring home. Each “medicine shop” has their own mix of herbs and no two are the same. The way of preparation also differ from person to person. The lighter colored soups tend to be more peppery while the darker colored ones tend to be sweeter and more herbal. I prefer the darker, more herbal version. **Not shown are rock sugar, garlic, and pork ribs. I used boneless pork ribs as I did have baby back ribs. You can also use a mix of ribs and meat, if preferred. 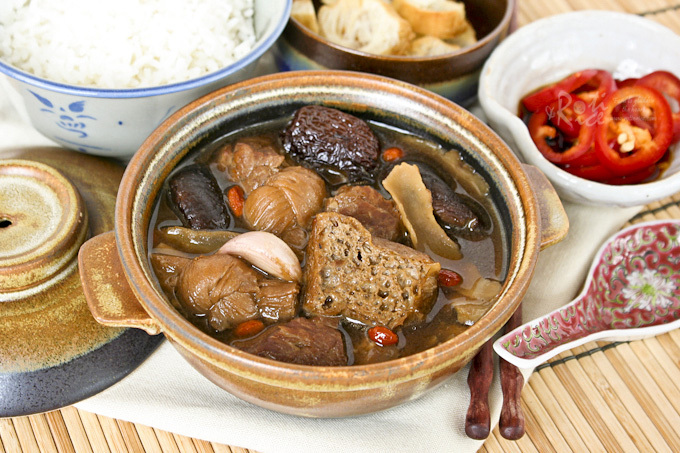 There is also a unique Malaysian version called Chik Kut Teh where the pork is substituted with chicken. Herbs that are not eaten should be placed in a muslin filter bag so that the soup remains clear. 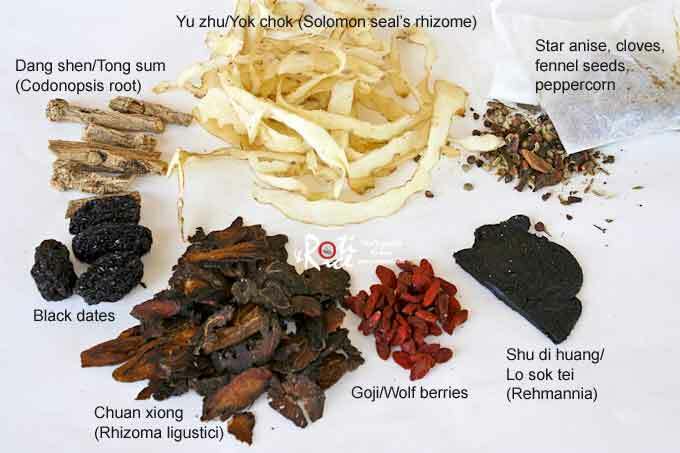 Place all bak kut teh herbs, except for spice sachet, Solomon’s seal rhizome (yok chok), and red or black dates in a muslin filter bag. Dong gui should also be placed in the muslin filter bag. When water comes to a boil, place muslin bag, spice sachet, yok chok, dates, and mushrooms in the water. Heat canola oil in a large fry pan. Add garlic and pork ribs. Sear ribs for about 3 minutes. Stir in dark soy sauce. Turn off heat and transfer pork ribs and garlic to huge pot. Add rock sugar. When liquid comes back to a boil, season with salt. Reduce heat to low and allow it to simmer for about 1½ hours. 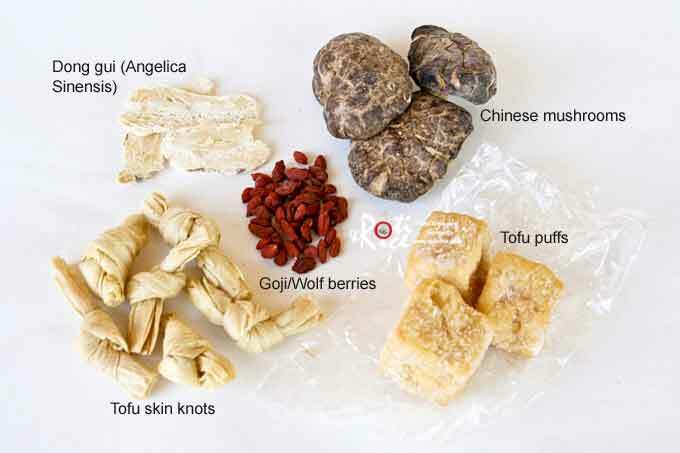 Add tofu puffs, tofu skin knots, and goji berries. Simmer for another 30 minutes. Discard muslin filter bag and spice sachet. Serve with steamed rice, yew char kway (aka as you tiao or Chinese crullers), and cut chilies in soy sauce. 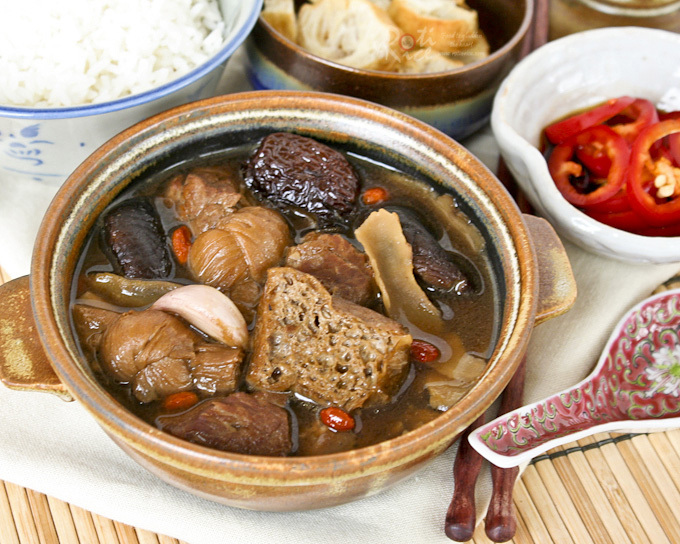 Bak Kut Teh is best served hot with steamed rice or fragrant rice cooked with shallot or garlic, yew char kway (also known as as you tiao or Chinese crullers), and cut chilies in soy sauce. A vegetable dish that goes well with Bak Kut Teh is tender crisp blanched Yu Choy Sum. It is a nice counter point to the meaty soup. All ingredients except the last three should be placed in a muslin filter bag. Red or black dates and goji berries should be soaked, rinsed, and drained before use. Note: Black dates tend to be sweeter than red dates. Measurements are only approximations. Please adjust according to taste. Biren, Thank you for showing us what herbs are inside a BKT package, great info, i never know what are inside the BKT package as usually i bought the powder form, hehehe..Next time, i will go Chinese herbal soup to make my own package like this. Ya agreed with Sonia, I too have not seen the contents of a bakuteh packet:) just throw into the water and cook:P Your bkt looks delicious! Same here. As a Cantonese I only had BKT at those hawker stall and now is so convenient to get BKT sachet and dump everything together in a pot. I did the same back then. Over here, I have to cook the dishes if I want to eat it. Forces me to learn and to take an interest in the ingredients. Looks live comfort food to me!Yum! I usually prefer the lighter peppery version (I think the Teochew version) of BKT but maybe I have not tried a delicious Hokkien version. Do give this a try. I think you should be able to get most of the herbs in California. Thanks for all the information! 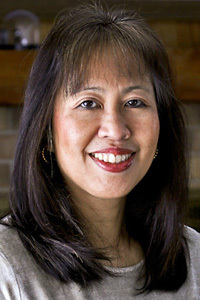 I enjoy learning about herbs and medicines in other cultures. I’ve tried the Malaysian version twice. I prefer the sweeter and herbal taste as compared to our SG version. So I’ll always buy sachets that are stated herbal. 🙂 I love dipping my yew char kway in the soup! YUMS! I have never made BKT soup at home…such a perfect warming and nutritious soup. This looks amazing! I have never tried this, but I know I would love it. the flavors and herbs are wonderful , thanks. I love learning about new dishes!! This is a winter comfort! I haven’t had it for so long! I would love to try this recipe, Biren. It looks like it has so much flavor, perfect for a winter day. I recognize some of the ingredients and bet I could find the rest at my favorite Asian market. Thanks for being part of my Favorite Finds. I have some of these herbs in my fridge as my mother in law left it before and had me brought some home from Taiwan. I didn’t have a recipe before but now I have! Looks like it’s very healthy and great detox which I am in need…. teehee! It is a great soup with white rice! Been making it for decades. My mom asks for it. Wow, what an interesting dish with pork ribs…I never had anything like this, so many different ingredients…must taste very good. I see tons of goodies in there, Biren! Of course my favorite will be the boneless ribs, yumm! I can imagine how cold it is where you at and this dish is really perfect. I hope you’re enjoying the rest of your weekend, Biren! I used to love sitting in the hawker centers of Singapore and dig into steaming bowls of bak ku teh but I cannot lie Biren, the ingredient list is scaring me to tears! LOVE IT! BTW, I am giving away a years worth of Sargento cheese so get on it, girl! Hi, Can you share the name and street of your medicine shop? I assume it is in Georgetown? My husband is will be visiting family in Penang in May, so he could fetch the herbs. I, too, have only used the sachet packets. I really enjoy your site. Thanks! The Bak Kut Teh you see here is actually made with herbs purchased in Kepong. I did say on Facebook that I was trying out herbs purchased in Penang and that came from Cheng Woh at Campbell Street. Unless you are cooking a small portion, you may want to add a few more slices of dong gui to the soup. I always do.